So I went to Target, got a pumpkin candle, turned on the AC, and tried to psych myself into believing it. I've had a fun time in my sewing room in the past week, though. It always seems like I have been doing a lot until I take pictures. Then it doesn't seem like so much. But nevertheless. I completed "My Granny is Amish," complete with machine quilting using no. 8 perle cotton! I'm not happy with the back. Hmmm...that would explain why I haven't taken a photo of the back yet. It took me awhile to figure out how to start and stop stitching when using perle cotton. I pulled all the threads to the back and tried burying them. Some successfully, some not. Or "knot" as the case may be. But I am thrilled with the front. I'm a fairly new member in the Stash Trad bee, taking the place of someone who had to drop out. I LOVE this bee. For the month of October, I was the one who got to choose the block. I'm not tired of my Granny yet. So..."Granny Says Boo!" I made a sample block. On Monday, I received my first block, from Amy. Isn't that always exciting? Opening the mail to see the fabrics your partner has chosen. Amy took a class from Lizzy House last week, and she had her sign some of the fabric in my block? Eeek! I mean "Boo!" Some of the other blocks are popping up in the Flickr photostream. Super cute. I can already tell this is going to be one amazing quilt. How I love my quilting friends! I'm just a couple of days behind in completing my block for Corey, whose month was September. It will go in the mail tomorrow. I had a good time making a complete mess of my sewing machine, finding fabric, cutting strings to make this eight-pointed star. I'll post a picture next week of the completed block. 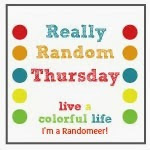 I'm linking up to Lee, who keeps us accountable every week. Love the perle 8 on the granny blocks! The colour combination makes me thing (for some reason) of South American colour combinations - the vivid brights and the deep black background. 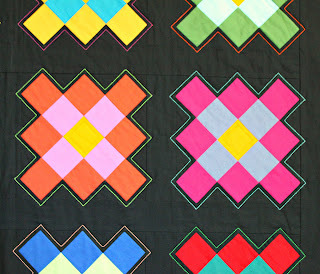 Love the quilting on the granny quilt! It really makes the blocks pop! How are you machine quilting with perle cotton?! I think it's a perfect Amish-quilted-granny-squares detail! Awesome. what a fantastic idea to machine with perle! How does that work? I L.O.V.E the perle stitching on you Amish Granny! Good for you for trying it! And you Halloween blocks are going to 'bee' scaringly (that's not a word!) great! We had 80 degrees in Melbourne today, and that is pretty hot too, for October! I love all the granny squares! I love the perle quilting on your granny - she's brilliant! Your granny bee blocks are going to be wonderful, I love the fussy cut pumpkin in the centre of Amy's block! Oh, and I can't wait to see that string star!! The perle quilting looks great. The black setting for your granny squares is great! Crank up that AC :)! Absolutely love your 'granny is amish!' A really nice variation on that project! Thanks for linking up to w.i.p. Wednesday, where I'm having the pleasure of guest-hosting! That perle quilting looks amazing!! Your Amish Granny turned out great (and don't worry, we don't need to see the back!). I also really love your eight pointed star, that one is on my to-do list. I adore your Amish Granny! The quilting is divine.... And Granny says Boo is over the top. Halloween is my favorite holiday! Love the colors. I know what you mean about the heat. I live in Imperial Beach, south of San Diego. It's been around 90 here, and I'm less than a mile from the beach---with NO AC....sigh. I got 2 of the last 3 fans at Home Depot, after calling around to 5 other places. It's supposed to be winding down this week. I'm keeping my fingers crossed. Fabulous granny! How did your bobbin react to perle cotton? oh, my!!!! 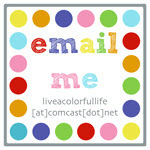 You've been busy, just lovely projects!!! and I so love how you psyched your mind into thinking fall was coming, totally hillarious! 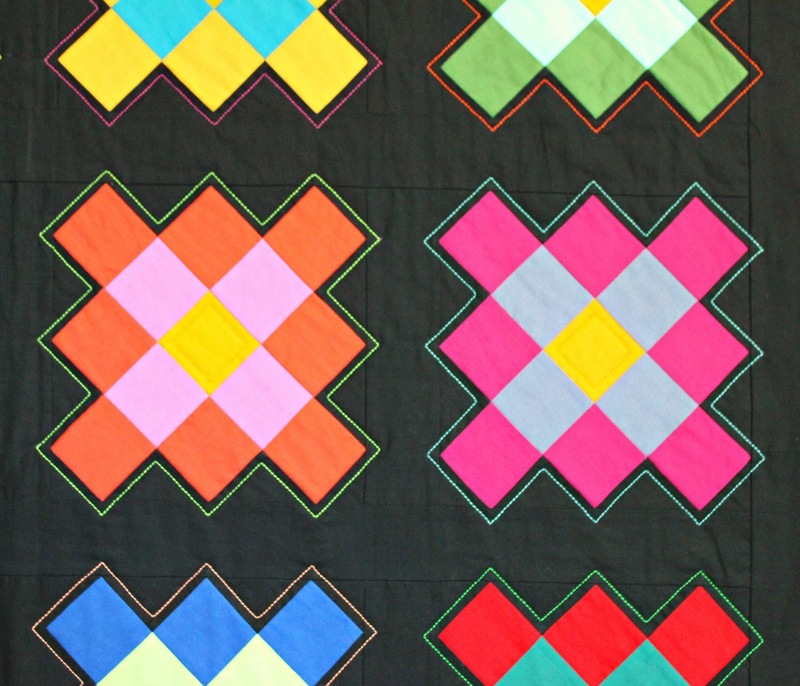 I love the contrast of the bright quilting on the black! It looks great! Can I be you someday!?!??! I just adore your work!! The perle cotton quilting...immaculate! I am sure the back just looks bad to YOU! Did you use a different bottom thread? I have the option of putting different materials in my bobbin on my sewing machine, but not sure how that works yet! Just curious on how you handled it! I just saw another block for that boo block....awesome!!! 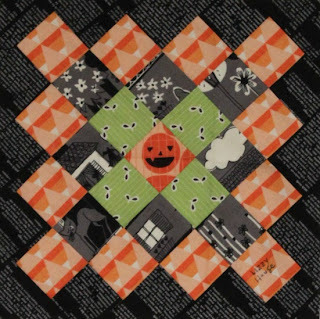 I have been trying to mentally figure out how all the bee, quilt block of the month, or other clubs work. I cannot figure it out. Do you make a number of the same blocks and send to multiple people? How does a person get a month? I'm sure you've explained it somewhere, but a quilt bee 101 post would be interesting, at least to me! You know, for you non-quilting readers! I totally loved making your block Cindy!! So much that I made a second one so I could get a better middle fussy cut for ya! Your My Granny is Amish is so fabulous and the quilting gives it such a spark. Great job! Come visit me! It totally feels like fall here! Just perfect 60-70 degree weather! I love your granny squares and how you're quilting them. I never thought of how difficult it would be to do the stops. Maybe you can figure out something, and I'd love to learn more about it. I saw that block on Amy's blog and knew you'd love that it was signed by Lizzy House. How awesome. You are getting some great blocks! How fun! Ugh, it's definitely October weather here, but I can't believe it's so close to my trip and SS now!!! Love your Amish Granny Quilt! Love it. Just visited Amish land in Indiana with my other quilting friends and have fallen in love with these solid color quilts! I love your granny quilt more every time I see it! That Pearl thread idea is so effective with your blocks . . . but only because you are SOOOOooo precise. If I did that, it would "look like a dog's breakfast"
Perfect spring day here in Sydney, Oz. The fussy-cut pumpkin in the middle of that granny block makes me smile. Also, I'm working on an Amish-style quilt and I think your quilting is really inspiring. Your Amish Granny keeps looking more beautiful! Love the added color in the quilting, Cindy. Your Amish granny is amazing!!!! Nice work, Cindy! I so wish I could quilt with perle cotton in my machine! Love how your granny quilt turned out. That green perle cotton thread looks so fabulous, making each block really pop. What a fun project!